Nice bicycle trip to Viimsi. I saw very interesting and unique blocks in there! That's Lasnamäe from many kilometers away! How massive Lasnamäe looks like from here! Like a big factory or something. Amazing car! Perhaps Ford Mustang. 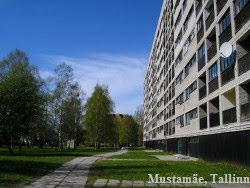 This one could be the local high school, the biggest in Estonia (by the number of pupils). That is Maardu, once part of Tallinn, now a separate city.